Atkins diet expected weight loss is higher than for most other diets, particularly during the first two weeks of the program, called the Induction Phase. 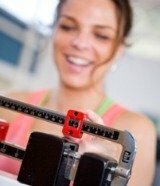 While how much weight you lose dependent on a variety of variables, including how overweight you are, how much you want to lose, and how physically active you are, you can expect that you will start out with quick weight loss and gradually stabilize until you're losing, on average, one to two pounds a week. The Induction Phase of the Atkins diet strictly limits the foods you eat. By cutting out all carbohydrates, you'll encourage your body to burn up stored fat as energy. During this phase of the diet you'll also lose some water weight, but for the most part you're genuinely shedding pounds as you adjust to your new metabolism. People who have more than forty pounds to lose can expect to lose anywhere from 8 to 15 lbs in the first two weeks. If you're losing twenty-five pounds or less, you may lose anywhere from four to ten pounds during Induction. On the Atkins diet, you don't want to stay in the Induction Phase for more than a few weeks for a number of reasons. First and foremost, it's not particularly healthy to completely eliminate carbohydrates long term. Many people also discover that they have less energy and are a bit cranky during the Induction Phase. By moving on to the second and third phases, you will be able to slowly add limited amounts of carbs into your diet. Your weight loss will slow to a healthy, sustainable 1 to 2 lbs each week. Studies have shown that this slower pace means you'll be able to sustain your new weight longer. If you aren't shedding the pounds at an average rate of one or two pounds a week, you may need to evaluate your eating habits. Check carefully for hidden carbs in your diet or scale back the amount of carbs you're eating by a few grams. Your weight can also be influenced by normal, day-to-day fluctuations, water retention, and even what time of day you weight yourself, so don't become frustrated. Instead of weighing yourself daily, step on the scale just once a week. Finally, don't compare yourself to others and don't forget that you may be losing fat and gaining muscle. This is particularly true if you've added a good exercise routine to your diet. You might lose two pounds of fat and gain some muscle, but because muscle is heavier than fat, you won't see a change on the scale. This is a great reason to track your measurements as well as your weight; sometimes lost inches tell the story better than lost pounds. If you still aren't happy with your Atkins diet expected weight loss, try going back to the Induction Phase for three or four days to jump start your metabolism.